Yemen's warring parties agreed at peace talks on the need for a ceasefire, but fail to work out the details. Yemen's warring parties have agreed at UN-sponsored peace talks on the need for a ceasefire but the details remain under discussion, a delegate to the discussions said on Tuesday, according to Reuters. The UN special envoy to Yemen, Ismail Ould Cheikh Ahmed, began shuttle diplomacy in Geneva trying to bridge differences between various political factions. But they still refused to sit at the same table and spelled out clashing agendas, the news agency noted. Yemen's civil war flared after Iranian-backed Houthi forces captured the capital Sanaa last September and thrust south and eastwards across the country, driving President Abed Rabbo Mansour Hadi into exile. A Saudi Arabian-led alliance began launching airstrikes on the Houthi rebels on March 26, aimed at restoring Hadi. Iran backs the Houthi movement, and it is believed it is planning to use them to take over Yemen and seize the key strategic port of Aden, which controls the entrance to the Red Sea and ultimately to the Israeli resort city of Eilat. UN Secretary-General Ban Ki-moon formally opened the Geneva parley on Monday calling for a humanitarian truce in Yemen, already suffering severe poverty and unemployment, to coincide with the start of the Muslim holy month of Ramadan. Although both sides set out low expectations for the talks, likely to run for 2-3 days, the head of the Houthi delegation appeared upbeat. "We believe that these ... these comprehensive consultations will lead to an understanding of the foundations for the start of political dialogue," Hamza al-Houthi told Reuters. 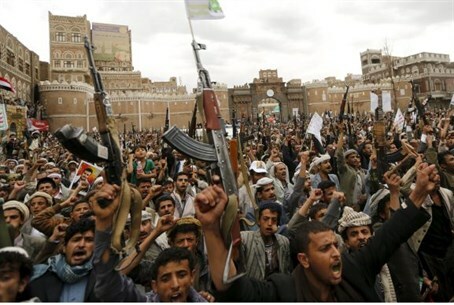 However, in a televised speech on Tuesday, Abdel-Malek al-Houthi, leader of the Houthis, said that while a political solution was possible, prospects were being spoiled by Saudi involvement. "There is nothing hindering a political solution in the country; the solution is available but they (Saudis) are the ones who ruin it with their aggression," he charged. Hadi, for his part, said in Saudi Arabia that the talks must focus only on implementing a UN Security Council resolution mandating the Houthis to vacate cities seized since last year. "We will not accept under any condition to go back to square one which talks about resuming previous dialogue under the threat of violence," he was quoted as having told a meeting of the pan-Islamic Organization of Islamic Cooperation.